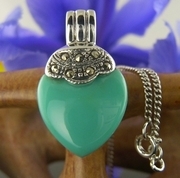 A magnificent handcrafted silver pendant, featuring striking inset marcasite stones and beautiful turquoise.MaterialSilver& MarcasiteGemstoneTurquoiseDimensions25 x 16mm16" chainThe marcasite features first class "diamond" cut facets ; exceptionally generous amount of hallmarked 925 silver used - making this a very strong piece. A really beautiful piece of jewellery. Admired by everyone who has seen it! !My jewellery comes in a handmade Mulberry Paper envelope as opposed to a box.If you require your item(s) to be boxed please let us know and add £1.25 to your purchase.P&P is £2.50 for the UK and £4.50 for Rest of the World.Please note that postage is per order - so multiple item purchases only pay 1 P&P charge.